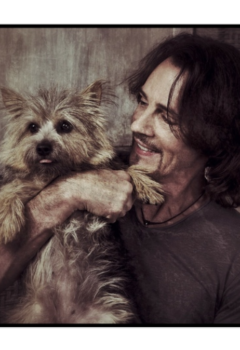 Rick Springfield is an accomplished singer, instrumentalist, songwriter, actor, and author. With 25 million records sold, a Grammy® Award for his No. 1 smash-hit Jessie’s Girl and a whopping 17 Top-40 hits, Springfield has toured for over 30 years, hand-delivering the hits to millions of fans worldwide during his legendary, high-energy live shows. He is currently touring in support of his seventeenth album The Snake King. Whether on the road or off, he is always a friend to animals often raising funds for non-profit organizations close to his heart. Rick and his family share their home with their dog Bindi (pictured).